You make one mistake, and you never live it down. Cope’s Elasmosaurus reconstruction blunder. Credit: Wikipedia. I think at this point it's no secret that I really really really like aquatic animals, especially of the extinct variety (in case you don't believe me, see here and here and here and here and here and here! Whew!!). So I just couldn't resist featuring another study on aquatic organisms that came out this week in the Open Access journal PeerJ. The study, by Rodrigo Otero, focuses on one of the more unusual groups of marine reptiles, elasmosaurids. These critters were first made famous by the discovery of Elasmosaurus platyurus by E.D. Cope in 1868, and his subsequent blunder by placing the skull on the tip of the very short tail rather than on the extremely long neck in his reconstruction. The mistake was pointed out later on, not by O.C. Marsh as was often claimed, but by Joseph Leidy, in 1870. Other older reconstructions of elasmosaurids often depict the animal with its head and neck completely out of the water, but more recent studies suggest that the weight of the neck would have prevented elasmosaurids from lifting no more than their head out of the water (Everhart, 2005). Nor would their necks have been all twisty and snake-like, as depicted in Charles Knight's drawings of these creatures. What was the biological advantage of such a ridiculously long neck? Well, if you were a large, hungry marine reptile in the Cretaceous Western Interior Seaway, wouldn't it be to your advantage to be able to sneak up on schools of fishes without them seeing your large body approaching? The head and elongate neck were the metaphorical emissaries of a very large and hungry army hoping for a sneaky attack and satisfying meal. 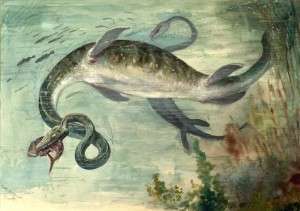 Charles Knight’s portrayed Elasmosaurus with a “snake-like” neck in 1897. Credit: From painting in American Museum of Natural History, public domain, courtesy Wikipedia. But an extremely elongate neck, while often synonymous with elasmosaurid plesiosaurians, is not exclusive to them. Other groups, such as the cryptoclidid plesiosaurians for example, can possess just as many cervical vertebrae as elasmosaurids, and so using the elongate neck as a feature to distinguish elasmosaurids alone is problematic. However, other cranial and postcranial features have successfully kept elasmosaurids united as a monophyletic group. 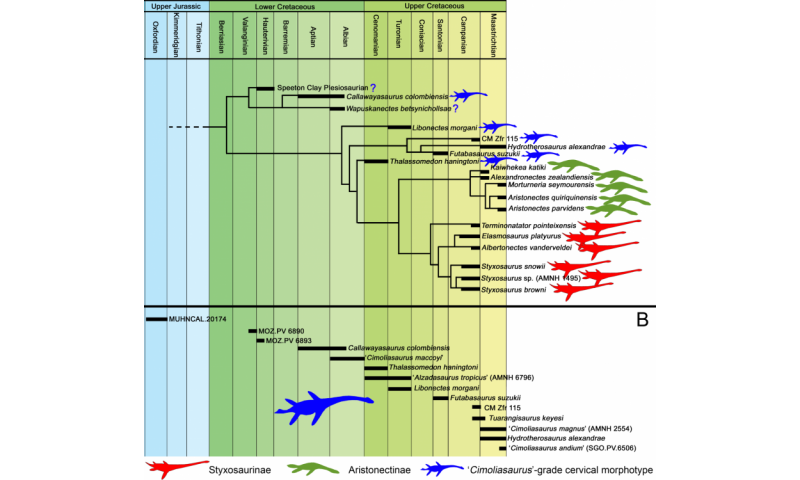 Phylogenetic relationships within Elasmosauridae, however, have been studied and debated by several researchers over decades. One family, the Aristonectinae, is recovered by Otero et al (2012) as a monophyletic group within Elasmosauridae. 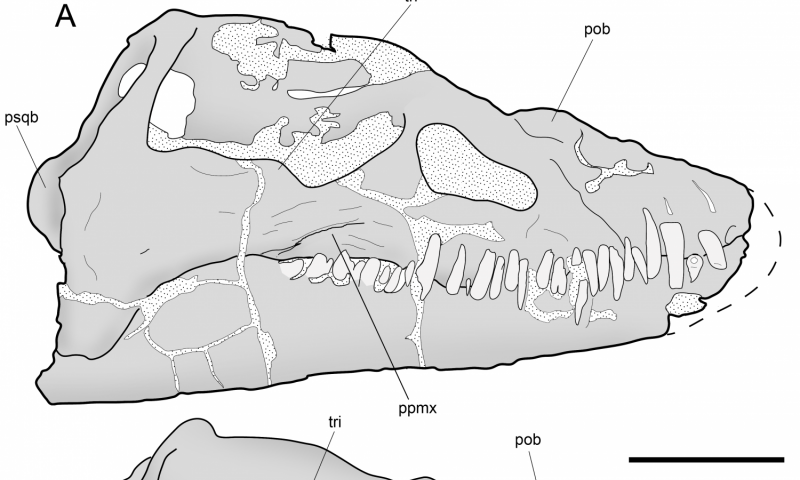 Otero's new study in PeerJ examined two specimens in great osteological detail. These two specimens, collected by Cope in 1876 and Barnum Brown in 1904, have been partly considered in other studies, but Otero's effort presents the most comprehensive and rigorous examination of these two specimens. The variation observed as well as the results of his phylogenetic analysis caused Otero to propose a few taxonomic changes. First of all, Otero recovered a new subfamily Styxosaurinae, and contains these two specimens. One (AMNH 1495), is considered Styxosaurus sp., whereas the other specimen (AMNH 5835), originally designated as Hydralmosaurus serpentinus, is now considered Styxosaurus browni, a genus that had been previously sunk. Whew! Okay. 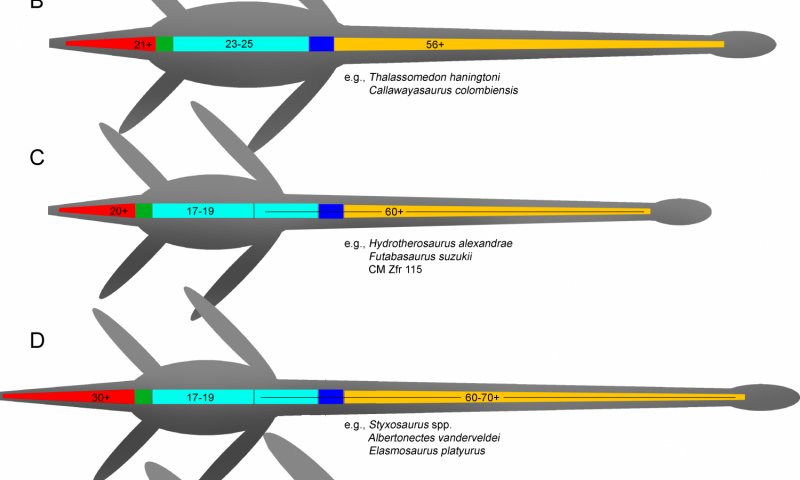 Taxonomic details aside, this paper also presents an interesting trend regarding the elongation of necks in elasmosaurids. Not only is the number of neck vertebrae important, but the shape and length of each vertebral centrum can play into the overall neck length. Something like a Thalssamedon elasmosaurid can have ~56–62 cervical vertebrae, and it's neck will be as long as Elasmosaurus platyurus, which has 72 cervical vertebrae, and it's all due to the variation in the length of individual vertebrae or acquisition of dorsal vertebrae into the neck. Otero (2016) notes discrete neck elongation events occurred in the "Mid" Cretaceous, Santonian–Maastrichtian, and Campanian, either through addition of more cervical vertebrae, or by shifting pectoral and dorsal vertebrae into the neck region (or by posterior shift of the pectoral fins, however you want to interpret it). Otero (2016) also notes one shortening event in the history of elasmosaurids, and this occurred in the Aristonectinae during the Maastrichtian. Otero (2016) provides evidence for morphological changes over time for elasmosaurids, both in elongation of necks, as well as shortening of necks, both no doubt providing their own evolutionary advantage for each respective group of elasmosaurid plesiosaurians. In addition, this study investigates biogeographical implications related to these respective groups. The paper is thorough and meticulous in its treatment of these amazing aquatic animals.